Fourth Grade Nothing: Fiddle Faddle - Grandma & Grandpa Loved It! - the butter toffee popcorn. My paternal grandma has been living with my dad for a while. This is giving us both a chance to spend more time with her. The other night my husband and I were at my dad's cooking dinner when I noticed something in the cabinet that totally brought me back. Does anyone remember this? You may also think of Poppycock when you think of Fiddle Faddle. It's basically toffee or caramel clusters of popcorn mixed with peanuts. It is unbelievably delicious and horrendous for you and kills your teeth with every delicious bite. Staring at this blue box with the Fiddle Faddle logo across it, I remembered being young. I remembered visiting Grandma up in the mountains of New Jersey which seemed so far from our home on Long Island. I'll never forget it actually snowed on Thanksgiving while we were up there. I thought it was so amazing to see snow before December. 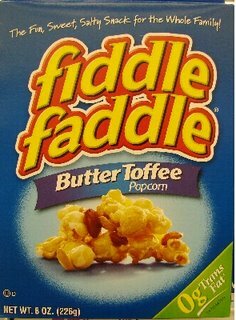 Anyway, Fiddle Faddle reminds me of my grandparents. Grandpa loved that stuff as well. Here's an old commercial for Fiddle Faddle. I think it was big in the early 1970s. I never liked the stuff; never have liked anything with toffee - I like my teeth-sticking snacks on the softer side, so caramel corn, rather than toffee corn and a Caramello bar, over a Heath or Skor bar. also, crunch n' munch! basically any variation of popcorn, peanuts, and "glaze" needs to be in my belly ASAP. Such a cute story. I love this stuff, but I have to brush and floss immediately after! Can't tell you how many boxes of that stuff I have eaten! LOVE IT!